"A shrimp mixture is spread on bread slices, coated with bread crumbs and fried to golden brown. These flavorful appetizers are a unique treat, and they may be made ahead of time and frozen." In a blender or food processor, blend shrimp, onion, ginger, egg whites, salt and pepper until smooth. Cut each white bread slice into 4 triangles. 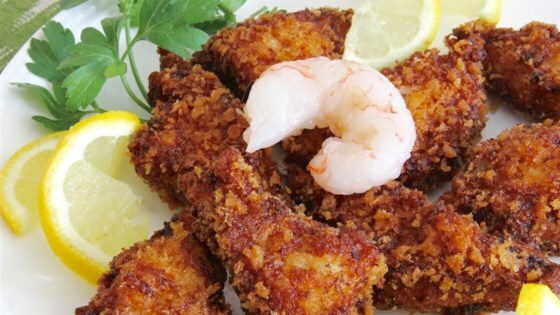 Spread both sides of triangles with shrimp mixture and coat with bread crumbs. Cover and chill in the refrigerator approximately 1 hour. In small batches, fry bread triangles 3 minutes on each side, or until golden brown. Drain on paper towels. Garnish with lemon juice before serving. The shrimp toast was okay. The texture was really good. It was a bit strong on the onion side. The next time I would cut down on the onion and add more shrimp.